SAINT AUGUSTINE – The re-opening of the historic sanctuary of the oldest continuous synagogue in Florida is planned Aug. 24-26 marking the rehabilitation of destruction in the sanctuary of First Congregation Sons of Israel which began in October 2016 when Hurricane Matthew wallop the oldest city. Further destruction followed a year later, September 2017, with the arrival of Hurricane Irma. “We’ve been closed for 22 months,” Karen Stern, treasurer of the congregation noted recently of the devastation. “Both did damage to primarily the sanctuary, adds Les Stern, congregation president. “We lost the power, all the electricity had to be rewired, all the seats had to be removed and restored,” just to name some of the havoc caused by the brutal storms. The three-day celebration will mark what is being billed as “Restoring Our Past. 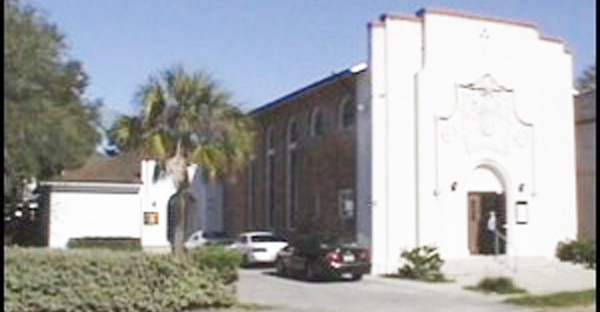 Building Our Future,” of the synagogue, 161 Cordova St., located in downtown St. Augustine. Festivities begin Aug. 24 with a 4 p.m. ribbon cutting, followed by wine and cheese and tours from 5 to 6 p.m.
Aug. 25 a reception and silent auction are planned from 6 to 8 p.m., with an historic overview and musical gala from 8 to 10 p.m.
Aug. 26 tours of the sanctuary will be offered from noon to 3 p.m.
Further information is available by calling 904-829-9532; or e-mail fcst192@gmail.com. The history of the First Congregation Sons of Israel is traced to the late 1800s. Today, the St. Augustine synagogue is known as the oldest continuous synagogue (building) in Florida. There are some structures which are older, but they are no longer used as synagogues.